2-1/16" x 1-3/4" adjustable base. Slide opening is 1-1/16" x 3/8". These were acquired as part of a package to repair a two-drawer chest in our 1998 Georgie Boy Pursuit class A motorhome. Just about everything made of plastic and rubber in this 16 yr. old motorhome is needing to be replaced; these sockets were used to replace ones that had broken, and were an exact match for the existing rails. 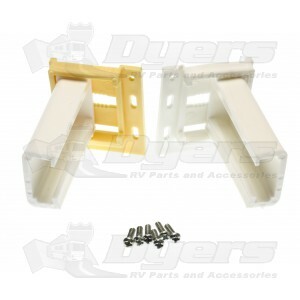 This is a good vendor for hard-to-find RV parts, especially for older motorhomes. Highly recommended!! These are exactly the same as the ones that came with your RV originally. They work and fit perfectly. Really appreciated the promptness in receiving my order!